MOUNTAIN VIEW, CALIFORNIA — Exolaunch, the German launch services provider formerly called ECM-Space, is preparing its most complex small satellite cluster to date. This spring or summer, Exolaunch plans to send 40 small satellites, including a 16-unit cubesat for in-space transportation startup Momentus, into orbit on a Russian Soyuz rocket. “The cluster is very diverse geographically,” Jeanne Medvedeva, Exolaunch commercial director, told SpaceNews at the SmallSat Symposium here. It includes satellites from the United States, Canada, Germany, Finland, France, the United Kingdom, Spain, Sweden, Israel, Australia, Russia, Ecuador, Thailand, Estonia and the Czech Republic. 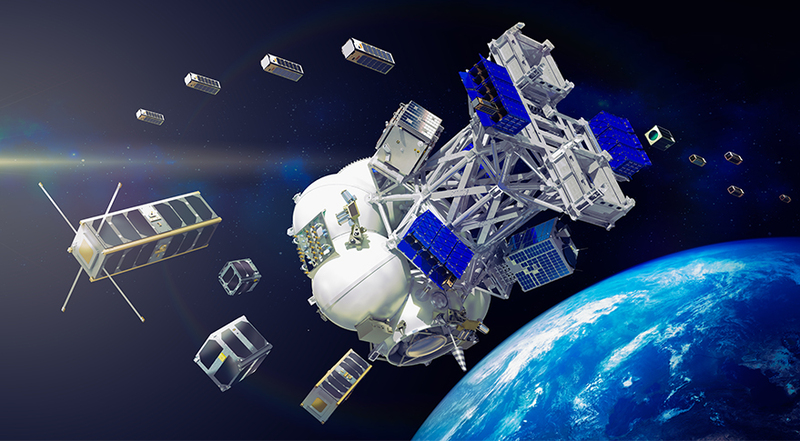 Since its first launch in 2013, Exolaunch, a spinoff of the Technical University of Berlin, has helped send 54 satellites into orbit, ranging in size from one-quarter of a single cubesat to a 110-kilogram small satellite. Many of those were German spacecraft funded by the German space agency DLR, including the 20-kilogram TechnoSat and four eight-kilogram S-NET communications satellites from the Technical University of Berlin, the University of Stuttgart Institute of Space Systems’ 110-kilogram Flying Laptop and Wuerzburg University’s one-kilogram UWE-4 cubesat. In 2019, Exolaunch plans to send more than 60 cubesats and microsatellites into space on multiple launch vehicles. To date, Exolaunch has sent cubesats and microsatellites to orbit on Soyuz rockets. The company is eager to begin working with other launch vehicle operators including the Indian Space Research Organization, Medvedeva said. In addition to matching small satellites with suitable launch vehicles, Exolaunch developed its own line of deployers and separation systems for one to 16-unit cubesats and microsatellites in the 15 to 150-kilogram range. Berlin-based Exolaunch has 25 employees and no external investors. “Maybe we will be open to investors in the near future,” Medvedeva said. Two well-known constellation startups, Spire Global and Iceye, are Exolaunch customers. Exolaunch has integrated more than 30 Spire Lemur cubesats on multiple launches with more planned for 2019. Exolaunch also will arrange launches in 2019 for at least two Iceye synthetic aperture radar microsatellites and manage those launch missions, Medvedeva said.